CCL Container takes beverage packaging to a whole new level with a full range of aluminum bottles for the beverage industry. Chill-retention, re-sealability, recyclability and durability – plus a wide range of decorating and shaping options – are just a few of the reasons why a growing number of beverage marketers now package their best brands in CCL Container’s aluminum bottlecan. Then there’s the “cool factor” of a totally different packaging option, one that commands immediate attention at the point-of-sale. From energy drinks to on-premise cocktails, premium liquors and more, our aluminum bottlecan gives marketers a high-performance container option that delivers unique, top-quality appeal. Aluminum has always provided the means for new brands to break into old markets. But now it has become the means for mature brands to revitalize their image and appeal to the younger consumer, especially in the beverage industry. With aluminum bottles offering so much opportunity for brand distinction, the race is on here and abroad to see who will make the most innovative use of size, shape, graphics, and even closure options. The emergence of new categories like energy drinks and specialty health drinks has many companies using the aluminum bottle as a medium for brand distinction. CCL Container, a leading aluminum beverage bottle manufacturer, has a broad range of bottle profiles, styles, and configurations, now available for commercial production. 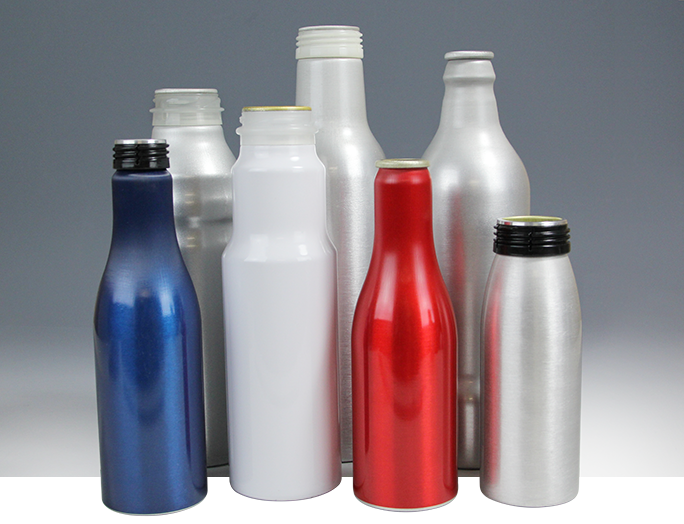 CCL Container offers aluminum bottles with a variety of standard finishes, designed to work with industry standard closures and caps, in addition to standard bottle filling operations. CCL offers a small portfolio of standard sizes, including 12oz and 16oz varieties. CCL Container’s bottlecans may be lined with a variety of coatings that extend product life and preserve the integrity of the contents. This includes drinks like sodas, juices, energy drinks and beer.